It’s hard not to think about Tony’s woes while reading William J. Dobson’s intelligent and absorbing “Dictator’s Learning Curve.” It’s a book that intricately explores the headache-making complexities of being an authoritarian tough guy in 2012. These despots may well be on anti-depressants too. Mass arrests and firing squads? For most of these men these are clumsy and a bit passé. Tax collectors and health inspectors are now more likely to shut down dissident groups. Today’s dictators confound their critics by peppering their speeches, the author says, “with references to liberty, justice and the rule of law.” Fair and balanced is how they wish to appear, contrary to realities. A new kind of iron fist has arrived, tucked behind an acid-whitened smile. 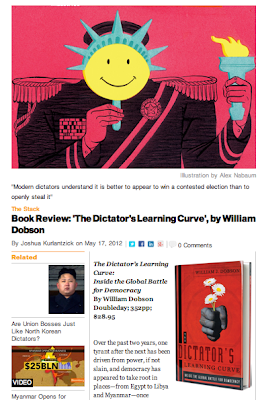 Mr. Dobson is the politics and foreign affairs editor of Slate; before that he was an editor for Foreign Affairs. He crisscrossed the globe multiple times while reporting this prickly book, traveling some 93,000 miles, he estimates.